What do you do when you feel lost as a leader? Always Growing tackles a common leadership challenge: How to successfully motivate, develop, and empower a diverse group of people to work together and achieve remarkable results. David has risked so much. Accepting his first leadership role at Trendex has meant uprooting his family and leaving behind a comfortable and secure position. The only upside may be that he is moving back to the place he called home as a boy - a place where his sister, Kelly, still resides and operates a thriving garden center. David quickly realizes that he is in trouble. He has taken responsibility for a division that is destined for the chopping block if he doesn’t soon figure out how to motivate his employees, prioritize their work, and unify them as a team. Sharing his concerns with Kelly leads to a very interesting revelation. Can Kelly’s proven method for growing plants show him the way to grow his team? 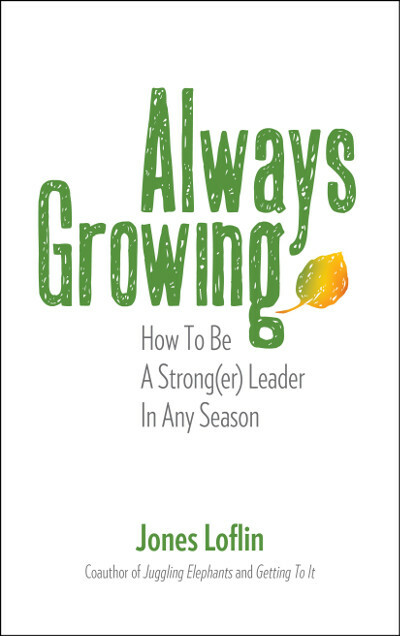 Always Growing is a warm and witty guide to becoming a stronger leader, whether you have been leading for two days or two decades. This clever gardening analogy will lead you and your team to a bountiful harvest. JONES LOFLIN is an internationally recognized speaker/trainer and the coauthor of Juggling Elephants and Getting to It as well as the author of Getting the Blue Ribbon. He has developed and delivered solutions for many Fortune 500 companies in the areas of work life satisfaction, time management, change, and leadership. Jones has also worked as the trainer of trainers for Who Moved My Cheese? LLC. He lives in North Carolina. The strategies outlined in Always Growing are perfect for anyone in your organization who is responsible for the development of others. Whether they have been leading for two days or two decades, they will find immediate application to their specific situation. To learn more about what Jones can do to “grow” your leaders, contact him!